Petitioner Sean Clerkin told MSP’s he believed Atos were “contract killers” who were “not fit” to sponsor the 2014 Commonwealth Games, on 18th March 2014. Mr Clerkin’s petition calls for the Scottish Parliament to urge the 2014 Commonwealth Games’ organising committee to drop IT company Atos as a sponsor. He told the Public Petitions Committee that the company, who assess whether benefits claimants are fit to work, were a “toxic brand”. Last month Atos confirmed it was seeking to end its government contract. Disability campaigners have described the work tests as “ridiculously harsh and extremely unfair”. Mr Clerkin said it was disappointing no MSPs, apart from the convener David Stewart, asked any questions about the petition. 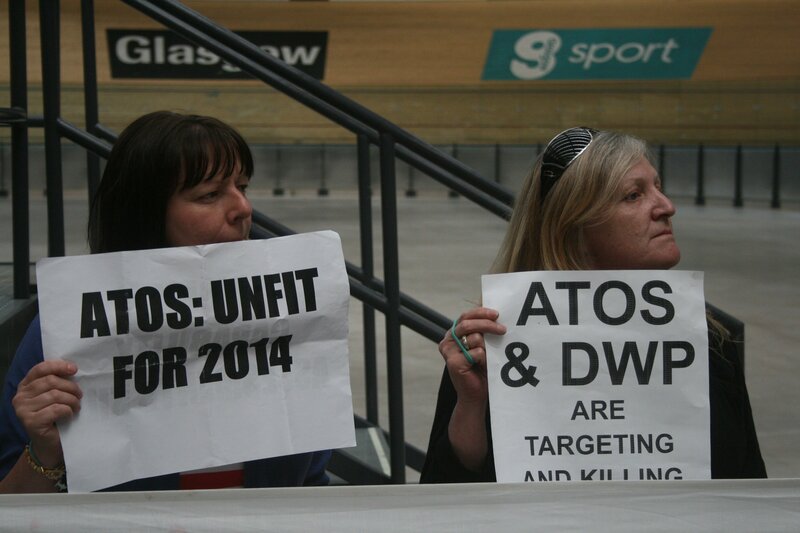 Iain MacInnes from Glasgow against Atos also gave evidence. The committee agreed to continue the petition and write to a number of organisations including the Department of Work and Pensions, Atos and the Scottish government. See also Grace Franklin’s Local News report here. Sean and Ian express their anger that no questions were asked by the committee on this hugely important subject. ← Housing Meeting Blocked in Bridgeton!